Camp for €20,- a night at Les Castels Les Princes d'Orange in low season with CampingCard ACSI. 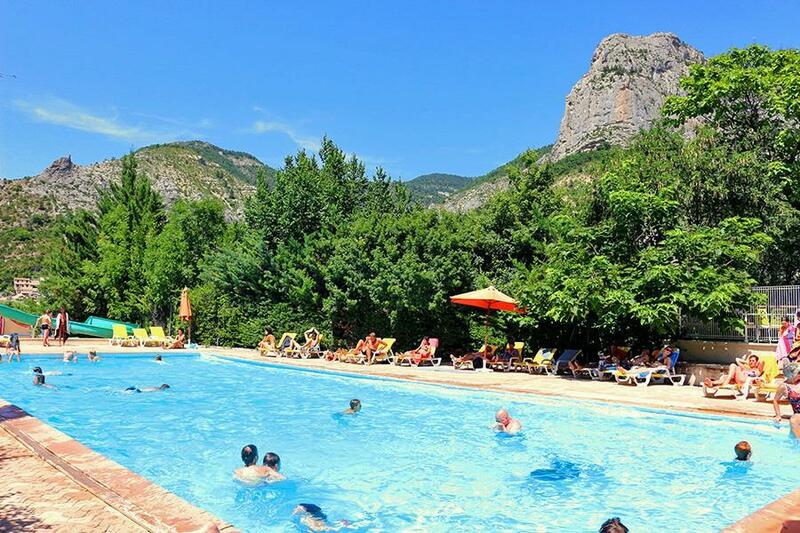 Les Castels Les Princes d'Orange, located in Orpierre (Hautes-Alpes), is a campsite with 89 touring pitches. With your CampingCard ACSI you can camp on one of the pitches during the following periods: 01-04-2019 - 07-07-2019 and 25-08-2019 - 03-11-2019. At this campsite you can not only use your CampingCard ACSI for inexpensive camping, you can also use your ACSI Club ID (as an alternative ID). A very hospitable and personal welcome awaits you at this smart family campsite with stunning views of the charming village of Orpierre. Lovely swimming pool. Renovated toilet facilities and playground. Plenty of activities in the mountains including climbing and walking. Indoor climbing wall at the campsite. Entorno encantador, el ambiente muy familiar y de montaña. El personal del recepcion y tienda fue encantador. Situado cerca del pueblo. Entorno muy tranquilo. What a fantastic place. The welcome from the owner was very friendly and she spoke excellent English . We had a choice of pitches, and picked one with the best view we've had on any campsite. The sanitary block was good, and the pool was very good. It is in a spectacular area, great walking and cycling, and climbing direct from the site. We will be back again. Très beau camping, beaucoup de nouvelles choses depuis 3 ans. Les sanitaires sont neufs, fermés et chauffés, magnifiques ! Le bar/ restaurant est superbe, la piscine est bien chauffée, dommage qu'elle ferme après le 15 Septembre ! L’accueil est très agréable et pleins de bons conseils pou se balader. Nous avons adorer notre séjour et nous reviendrons chez vous ! Wat een fijne camping. Voor sportievelingen een must. Wij hebben hier 17 heerlijke dagen doorgebracht. Genoten van het klimaat, de omgeving en de rust. Gratis wifi, maar geen ontvangst op de mobiele telefoon (ligt aan de provider, want de Fransen hebben wel ontvangst). Wij komen beslist nog eens terug, als onze gezondheid het toestaat. Would you like to book Les Castels Les Princes d'Orange or request more information? You can do both using the information below or by visiting the campsite's website. N75 Serres-Sisteron. Turn off at Eyquians. Campsite in the town of Orpierre. CampingCard ACSI will send your information request to "Les Castels Les Princes d'Orange".